Reaching the NCAA tournament is every college basketball player’s goal each season. 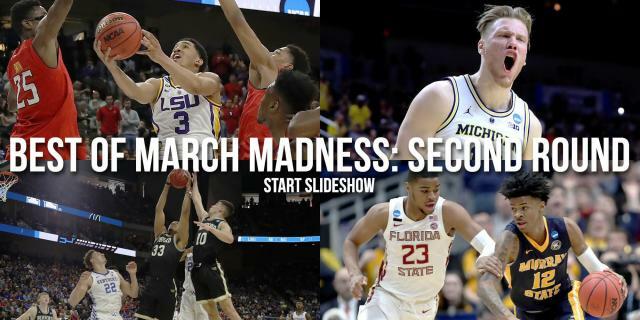 When teams earn their bids and find out where they will be playing in the Big Dance on Selection Sunday, players’ families often scramble to find a way to get to the first-round sites just days later. They, understandably, want to see their children play on the biggest stage the sport has to offer. Traveling to those games on such short notice, though, isn’t always an easy task — and can be extremely expensive. Houston coach Kelvin Sampson has seen that firsthand. Sampson said it’s often not only the cost of traveling that prevents parents and families from attending the NCAA tournament, but the act of traveling and locking down an affordable hotel room. The family of one of his players simply can’t afford to do that. "I've had families ask if they can sleep on their son's hotel room floor"
Sampson and his team took a flight from Houston to Tulsa, Oklahoma, for their first two games at the BOK Center, forgoing the nearly 500-mile drive. Players are provided with a hotel room through the duration of the tournament, too. Those rooms, though, aren’t available for families. There are a lot of issues surrounding the NCAA and the lack of compensation for its student-athletes. Sampson will be the first to tell you that he doesn’t have all the answers to solve those problems. But with how big college basketball and the NCAA has become, he thinks it’s only right that the governing body takes care of player’s families in the postseason.